Hundreds of people in the Kettering area gathered at the “Kettering Rec Center” in order to honor a lost but never forgotten firefighter/paramedic. 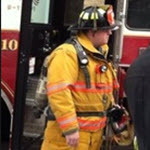 This hero saved dozens of lives throughout his time as a professional Firefighter/Paramedic. He unfortunately passed away in a car crash on September 19th, 2015. Officers determined that it was a drunk driver whom hit him & thus by ended his life. Kevin McMacken was remembered this week by his fellow firefighters and others from around the region. They all went to the hockey rink as hockey was Mr. McMacken’s favorite sport. There was a ticket price of $5 for all whom attended and various concession stands that donated all their profits to the McMacken family as well. The reasoning for this is because Mr. McMacken’s wife is now widowed with one young child, a second one on the way as well. It appears that their story is starting to make waves around the country slowly as the new continues to travel further down south. Firefighters from the Kettering Fire Department are considering putting up a GoFundMe page in order to generate more donations for the family. Though the loss of her husband will never be healed or replaced, it’s good to know that their community and the citizens of Northern America are willing to give to those in need still. Apparently the McMacken family has decided to donate a portion of the funds their receiving to the “Sinclair Community College for Firefighter/Paramedic’s Program” as a thank you to all those willing to help them.